2015 marks the 150th anniversary of one my most treasured children’s books – Lewis Carroll’s Alice in Wonderland. The nonsensical book has more depth than anything I’ve ever read really, (yes really!) and the more times I’ve read it, the more I’ve enjoyed it. 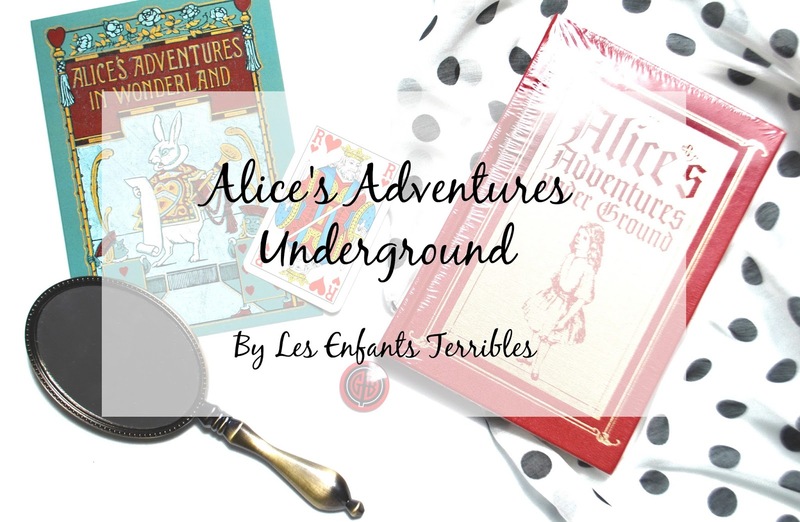 To mark this auspicious occasion, there have been a number of things taking place all over London however one of the most exciting ones was ‘Alice Underground’. April was also my birthday month and so as soon as the tickets for this were released I was sooo pleased to have gotten my hands on a pair. The perfect celebration! On the day my bf and I, all decked out in the requested black and red dress code and made our way to the underground vaults in Waterloo. As usual we had no idea where we were going and since the location was at a completely different entrance to the Leake Street entrance (be warned in advance if you’re planning on attending) it took us a while before we finally found it. The entrance is tucked into a side road and through what I thought was an entrance to a garage. After making our way to the reception, we were greeted by a lovely lady who checked our tickets and stamped our arms with Mr Rabbit’s clock. Not gonna lie, I was crapping myself with excitement by this point. Clearly I’m easily amused! Whilst we waited for our time slot, we were able to sit in the seats of the underground cinema and had the option of getting a drink beforehand. The setting and atmosphere was brilliant. I loved that everyone had made an effort with the dress code too. Once it hit 2pm, we were all queued up and led into the immersive experience. First stop was an eery room with papers strewn across it. About 30 of us crammed into the silent room slightly apprehensive about what would happen next. After just enough time to look around and feel completely lost, Alice appears in the mirrors all around the room and speaks to us asking us to help her. It’s brilliantly executed and just as Alice fades away, a doorway bursts open and off we go, deep down underground. I don’t want to ruin the experience or the surprises they have in store but I will say that throughout we got to meet a number of characters from the book and some of my favourite scenes from the book were recreated infront of us. But before we really began the adventure, we were asked to pick a path – “eat me” or “drink me”. Choose carefully though as your choices will determine which suit your placed in. We were extremely lucky and got sorted into the hearts! We were taught a special salute for the Queen of Heart’s and since we were now on the queen’s side (eek!) we were given a mission to solve – who was painting the roses red?! Luckily we managed to get it right and as a reward we were given these cute little badges to wear. 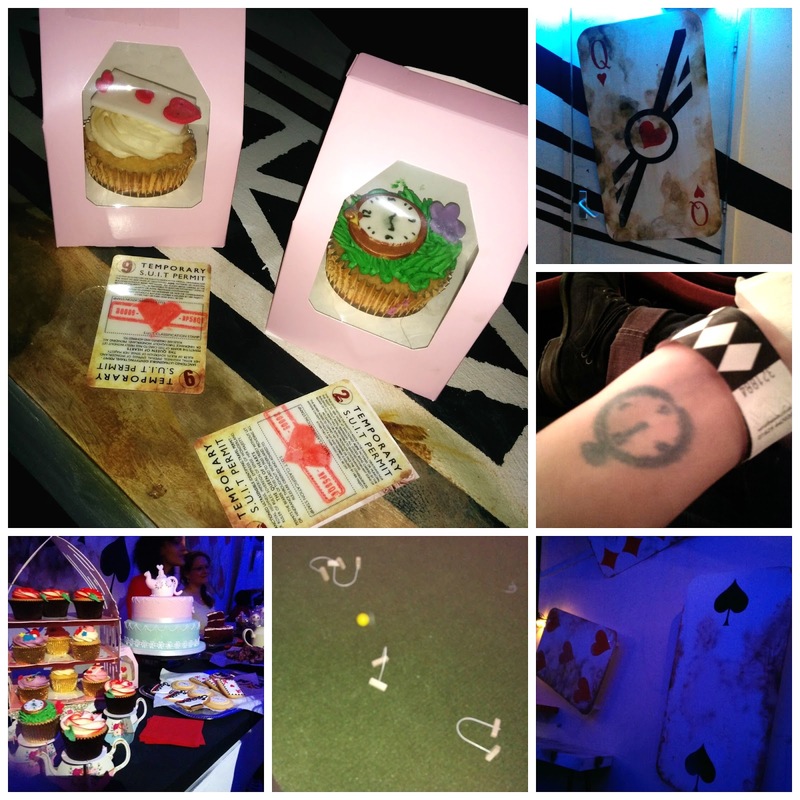 My most favourite part was the mad hatter’s tea party. If you buy premium tickets you get to have a drink whilst you sit at the table which I’d recommend. I had some sort of iced herbal tea which tasted like sweets.The actors were mesmerising and I honestly felt like I was Alice. Dream come true! Once all the magic is over, you walk out into a lounge area. There’s an acrobat, cupcakes and croquet! No flamingo’s though. During your visit to the Queen’s land, you’re also given a temporary suit permit. This is something you’re allowed to take home with you. Keep it safe because it will allow you access to the bar after 10pm on certain days. Overall this has to be one of the best experiences I have ever been to. It was executed so brilliantly and their timing for everything was beyond perfect. I would recommend it to absolutely everyone. I’ve literally been singing it’s praises since I’ve been. Sadly the show is only on until August 30th so book your tickets asap to avoid disappointment!